Posted on December 6, 2018 at 5:52 am. We begin today with WOLF PACK PRIDE! There are a lot of AMAZING students here at WMS. And you deserve to be recognized! 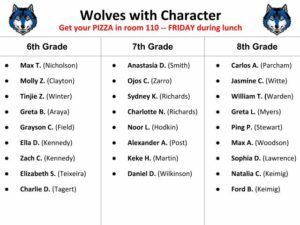 Teachers from every grade and every team have identified a distinguished group of students to receive this month’s Wolves With Character Award — for demonstrating outstanding CITIZENSHIP in their daily lives. Just take a look at the screen to see all the deserving honorees from the 6th, 7th, and 8th grades. Congratulations, wolves with character! Be sure to stop by room 110 during your grade-level lunch on FRIDAY and pick up your free pizza! Come on out for a BOOK BONANZA! The WMS Academic Book Fair is OPEN FOR BUSINESS — from now until December 12th in the library. 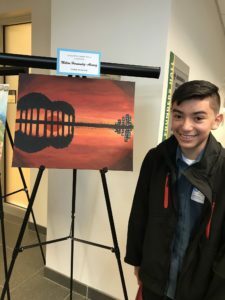 6th, 7th, and 8th graders will all have a chance to visit with their English classes — but everyone is welcome to stop by any day of the week — either before school or during your lunch period. Plus, the fair will also be open late-night TODAY and next TUESDAY to coincide with the Winter Concerts. So don’t forget to bring your money — and go get yourself a good book! Get ready for a musical treat! The WMS Band’s Winter Concert is scheduled for TONIGHT at 7 p.m. in the auditorium. Come see your friends and classmates — who happen to be some of the best and most talented musicians in Arlington — as they perform the songs of the season. The event is absolutely FREE — so come on down and enjoy the show! It’s better to GIVE than to RECEIVE! There’s just ONE WEEK LEFT for the Kindness Club’s “Fill the Cruiser — Holiday Toy Drive.” NEW and UNWRAPPED gifts may be dropped-off in the grade-level bins in the library. Everything that’s collected will be given to local children in need this holiday season. And remember — whichever grade donates the most will be entered into a raffle to receive a special token of gratitude. Spread kindness where you may, and donate to the Toy Drive TODAY!! The WMS Jazz Band Club will be hosting its next “Jam Session” TODAY during ASP 1 in room 225. All instruments are welcome! Go to the Jazz Club page on the WMS website for more information and to contact the band leader, Mr. Wilkin. You’ll have a swingin’ good time! Attention MUNners!! There will be a meeting TODAY for all conference participants and Chairs during ASP 1 in room 202. And then on FRIDAY, help is needed to prepare for the upcoming WOLFMUN Conference. See Mr. Carlson for more information, or with any questions. Sister Circle will be holding its morning meeting this FRIDAY at 8 a.m. in the library. Participants will be preparing special activities for the holidays — so you won’t want to miss it. All young women are welcome — new members and old, friends and allies. See Ms. Mays with any questions. The Williamsburg SCA will be meeting TOMORROW immediately following the Morning Announcements in room 215. See Mr. Tagert or Mr. Peacock with any questions.